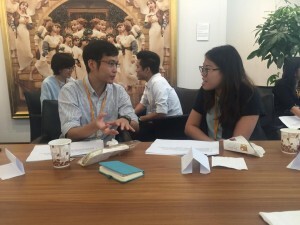 “UBS x TUF Mentor the Mentor”, a program in which UBS mentors provide a series of training sessions to Program Mentors on topics like project management and creative thinking throughout the academic year, was launched on August 24th. During the launch luncheon, enthusiastic UBS Mentors learned about TUF’s program and how they could provide relevant training to assist our Program Mentors’ work and personal growth. The first training session was held on September 2nd with a time management topic. Program Mentors learnt useful tips for better utilization of time in the face of the busy school schedule.